Small stickers to customize clothes or to cover small holes in our favorite clothes. Iron-on sticker (patch) with an embroidery of a small butterfly in pink colors and with a heart in the wing.Dimensions: approx. 20 x 25 mmContent: 1 iron-on sticker.Material: Textile. 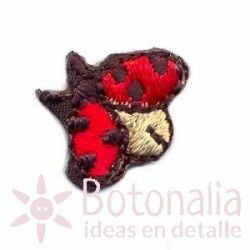 Iron-on sticker (patch) with an embroidery of a small ladybug smiling.Dimensions: approx. 18 x 22 mm.Content: 1 iron-on sticker.Material: Textile. Iron-on sticker (patch) with an embroidery of a small bee with blue wings.Dimensions: approx. 20 x 22 mm.Content: 1 iron-on sticker.Material: Textile. 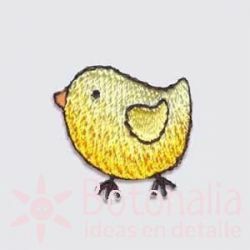 Iron-on sticker (patch) with an embroidery of a small yellow chicken. Perfect as a decoration for children's clothes, school clothes and all types of fabric accessories. Dimensions: approx. 19 x 21 mm.Content: 1 iron-on sticker.Material: Textile. 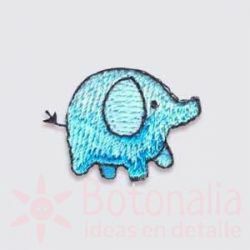 Iron-on sticker (patch) with an embroidery of a little elephant in light blue color. Perfect to decorate children's clothes, school clothes and all types of fabric accessories. Dimensions: approx. 18 x 22 mm.Content: 1 iron-on sticker.Material: Textile. 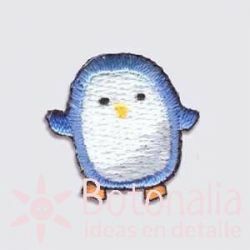 Iron-on sticker (patch) with an embroidery of a little penguin in blue and white. Perfect as a decoration children's clothes, school clothes and all types of fabric accessories. Dimensions: approx. 20 x 23 mm.Content: 1 iron-on sticker.Material: Textile. Product Description: Sticker (patch) with an embroidery of a small basket of flowers.Content: 1 iron-on stickers.Dimensions: 17x17 mmMaterial: Textile. Product Description: Sticker (patch) with an embroidery of a yellow flower.Content: 1 iron-on stickers.Dimensions: 17x12 mmMaterial: Textile. Product Description: Sticker (patch) with an embroidery of a small flower in pink.Content: 1 iron-on stickers.Dimensions: 17x12 mmMaterial: Textile. Product Description: Two stickers (patches) with an embroidery of a flower with a heart in pink colorContent: 2 iron-on stickers in different models.Dimensions: 25 mm of diameter.Material: Textile.